Available In Several Finishes Including: Polished Brass, Antique Brass, Polished Chrome (shown), Oil Rubbed Bronze, and Brushed Nickel. Solid Brass Harvest Key Hole Cover (Polished Chrome Finish). 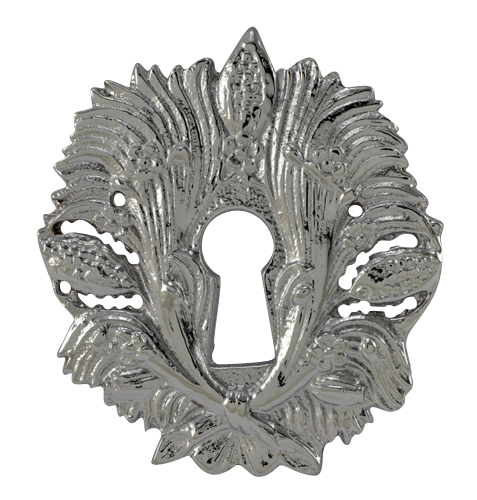 The Harvest Key Hole Cover measures 2 1/4 inch by 2 1/2 inch tall. The key hole measures 3/8 inch wide at it's widest point. Each piece is constructed from solid brass and finished by hand. Available in several finishes including polished brass, antique brass, oil rubbed bronze, polished chrome (shown), and brushed nickel.